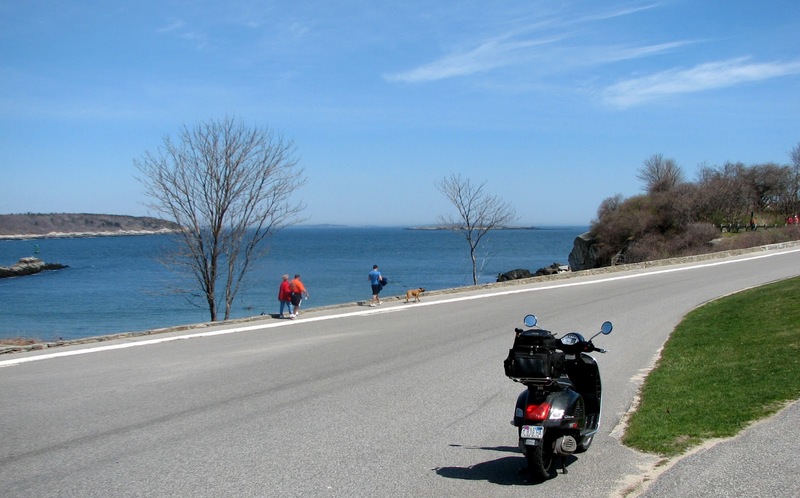 Scooter by the Sea: Go Fly A Kite! 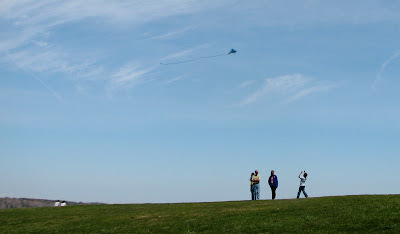 On a perfect early spring day at Fort Williams Park in Cape Elizabeth, it seemed that someone had suggested "Go Fly A Kite!" 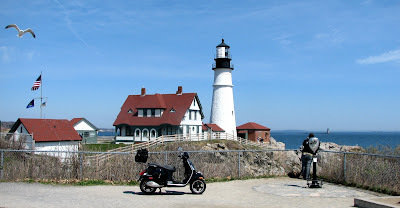 And a dozen or so eager kite fliers obeyed, filling the clear windy sky in the shadow of Maine's most famous lighthouse with kites large and small. Below the remains of the Fort Williams batteries and barracks, visitors stay a respectable distance from the icy ocean. Until August, walking the paths in and around the park is more popular than swimming. But for about 20 minutes in late August, the ice melts and a few brave souls put to sea. 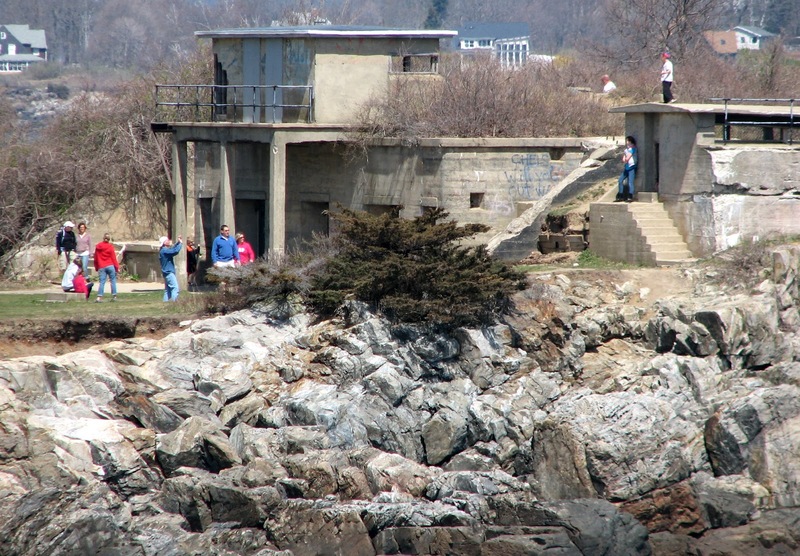 Ram Island Ledge Light, a mile from Portland Head light, was auctioned off in 2010 for $190,000 to a Windham surgeon. Since 2001, the light has been solar-powered. Landing a boat - the only way to get to the ledge - has been described as "treacherous." 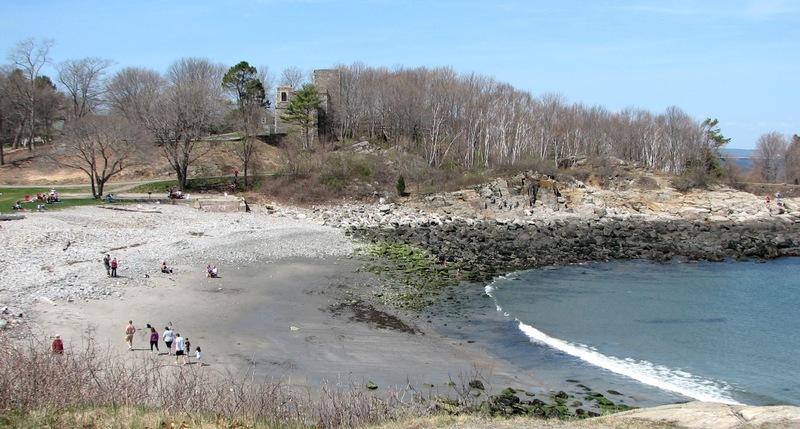 The ledge is under water at high tide; the only way to enter the lighthouse is via a 30-foot ladder. But you can't beat the view! One of the things I love about blogs is learning about places I've never known about. Ft. Williams is such a place. Thanks to you and Google I now know about this place and its place in our history. Thanks for the share. 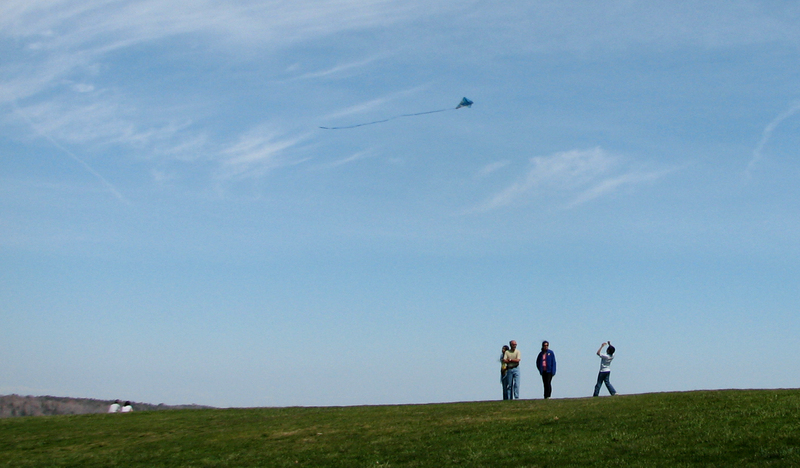 And, I love the photo of the fighter kite! with people visiting this treasure. Thanks for taking us out there. I totally like the pic with the lighthouse and the scooter in front. Thank you. It's quite a place - and the most photographed lighthouse in the US. The "treacherous" may be why the good doctor bought the place. No neighbors, great view, and little likelihood of anyone ringing the doorbell after you've gone to bed! Yay Thomas! Wonderful and fun photos. The first one is darn near poetic! You've got a good eye. And one is all you need! Thank you! I am full of some kind of joy, having discovered riding and photography. People often say - and I have said - "It's too bad I found this so late in life." I'm just glad I found these pleasures at all.